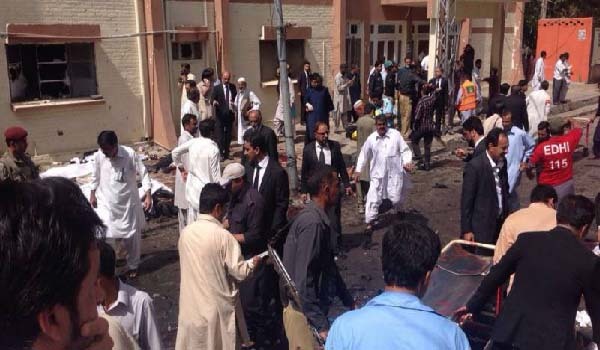 QUETTA, Aug 09 (APP): Death toll of Quetta suicide bomb blast has risen to 72 after two injured including a lawyer and a 14-year-old boy succumbed to their injuries at Combined Military Hospital Quetta. The official sources said that Advocate Naqibullah and a 14-year-old boy who suffered splinter injuries in the suicide bomb explosion took place outside the Emergency Ward of Sandeman Civil Hospital Quetta on Monday were brought to CMH Quetta for medical treatment. “The condition of the injured was very critical and they were given medical treatment but they could not survived,” doctors said. of lawyers and journalists beside others at the spot as the suicide bomber detonated himself among the gathering, an official of the Bomb Disposal Squad (BDS) said. Meanwhile, some official sources at the Sandeman Civil Hospital Quetta claimed that due to shortage of emergency medical aid equipments, especially which were used for oxygen supply to patients who suffered splinters’ injuries in the attack or gunshot in firing, adding that due to which the injured of the blast were shifted to CMH.